A couple of years ago I swam at Balmedie Beach. It was March and so I just missed out on being able to say I swam in the North Sea in winter. 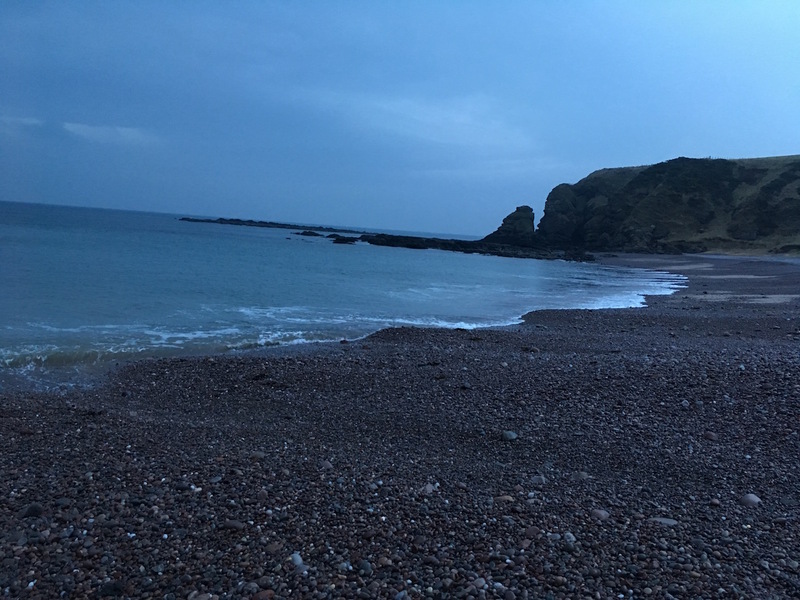 We’re currently staying at a secluded spot up on the Fraserburgh coast an hour or so north of Aberdeen and so I decided to take the opportunity to go swimming again. Oh my goodness it was cold. 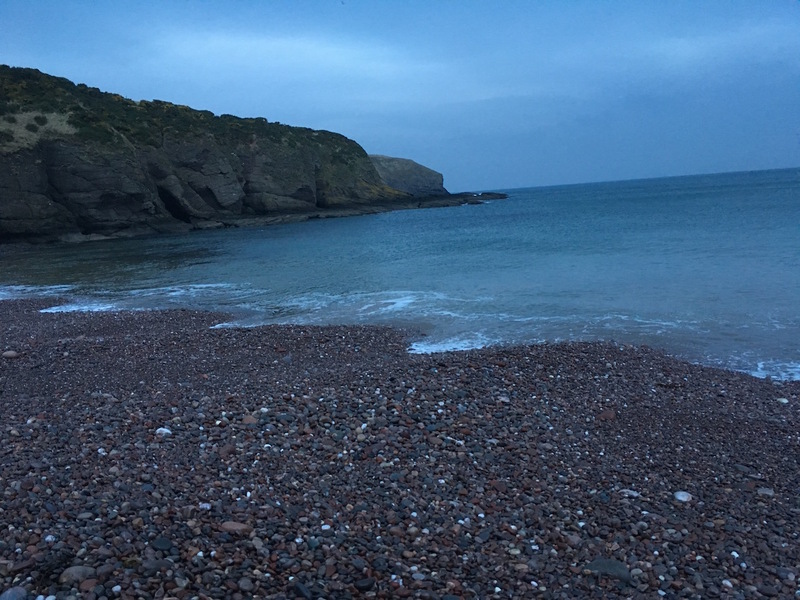 Although I think the water temperature was probably about the same as when I swam at Balmedie (6-7C) it was harder this time because rather than sand the beach here has pebbles and when your feet are frozen pebbles are painful to walk on. But I did it and hopefully a 30 second dip still counts as swimming. I had to go in twice because, like last time, Ben didn’t take a photo of the first dip! I was not happy. I’m 41 years old and have had two children but I think I’m in pretty good shape nevertheless. I attribute this to an active lifestyle and mostly vegan diet. I also don’t consume drinks other than tea and water – with the occasional sip of whisky thrown in. Drinks like orange juice, wine, and beer are full of calories and don’t fill you up so you still eat your regular meals but exceed the calorific requirement from fluids. I also exercise every day by using cycling as a mode of transportation. When I got out of the water I was able to stand on the beach in my bathers without feeling cold at all. I felt quite warm. I also saw a couple of seals swimming. Ben took this video of the first swim. While I look brave in the photos if you watch the video you’ll see what a wuss I was. I got up early this morning to walk along the beach as the colours in the sky are nicest at sunrise and sunset. Sunrise here is not until 8:20am so it’s not that early. It’s a lovely, peaceful spot. 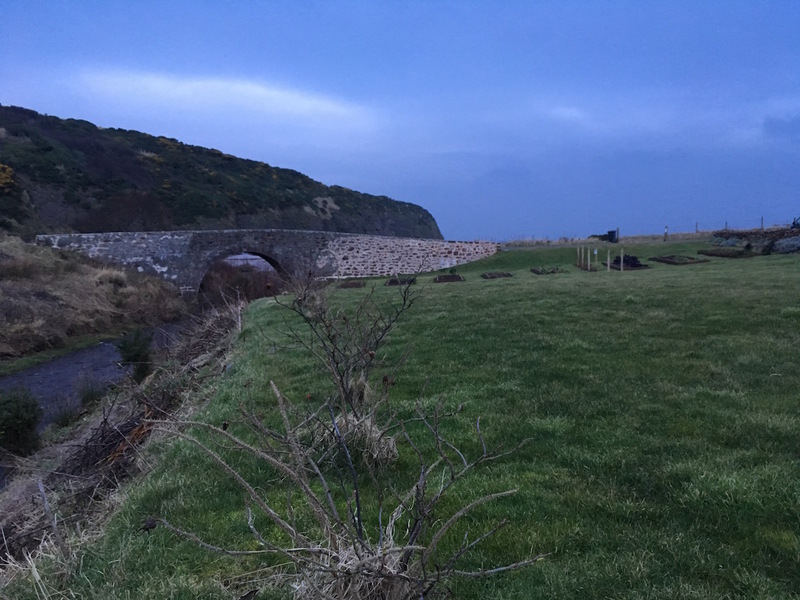 Posted in Journal, Travel and tagged beach, Fraserburgh, North Sea, Pennan, photos, swimming. Bookmark the permalink. I used to swim in the rivers in the Scottish mountains, brilliant but often colder than the sea. I bet that was refreshing! I was so cold. And thank you – cycling is great! You nutter! 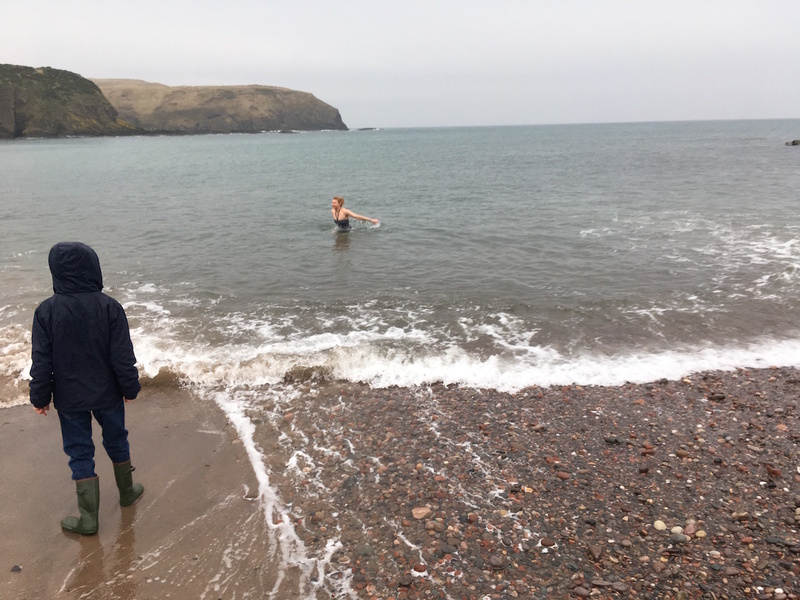 lol – People look at me on the beach like I’m a crazed lunatic in Cornwall when I go in after the kids out of season, with no wetsuit or anything like that. It is weird though – if the kids are in the water, I can do it without giving it a second thought. I imagine the sea is pretty cold in Cornwall at this time of year too. My kids had no interest in going swimming. They thought I was nuts! Yes, the sea is getting colder down here in Cornwall, around 10C but not yet in ‘ice-cream headache’ territory! 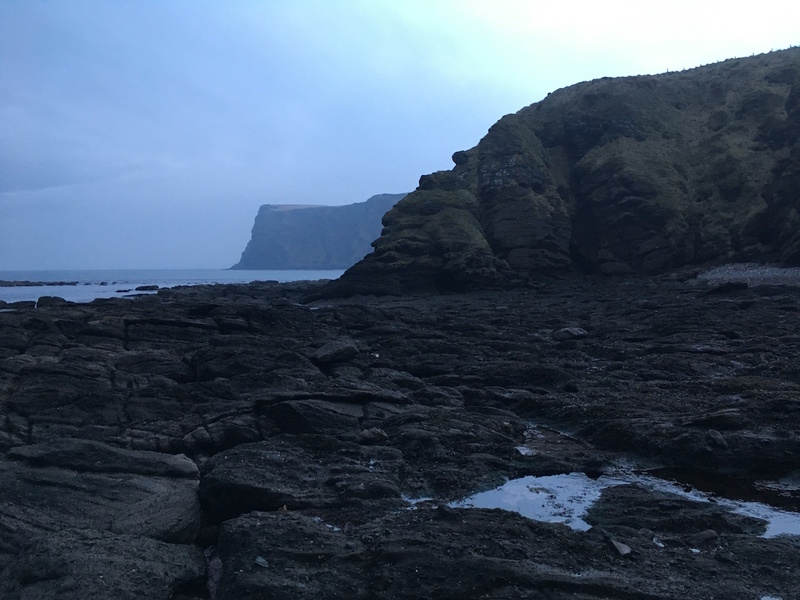 It is about 2.5C colder up there on Scotland’s east coast. Well into ‘ice-cream headache’ territory. Did you dip your head under water? You look cute in the swimsuit and boots! One would never know how cold it really was, until your children appear in hooded parkas. Brrr! I will agree riding a bicycle everywhere and eating a ‘clean’ diet keep you in great shape, but not even a glass of wine in the evening? I need my coffee in the morning and a little wine in the evening for comfort. Daily cycling. A clean, Vegan diet. And, cold winter swims. The perfect recipe for a long, healthy life. Well done. Thanks! I’d love to say I’ll make a habit of cold winter swims but I think they’ll be a rare event. I’ve always wanted to do one of those New Year’s Day dips though so I might do it again sometime. Woah Rachel, you are made of steel! Brrrrrr! You have always been my inspiration for how I would like my body to be when I turn 40. Thanks for inspiring! Thanks, Chait! What a lovely thing to say. I’m pretty sure you’ll be in fantastic shape when you’re 40 because you look after yourself.